The Invisible Histories Project is gaining momentum. We have now filled the places for the oral history training and are hoping to confirm dates this week. There is a reserve list for those still interested though so do still get in touch if you’d like to be involved. We will be publicizing the project over the next month or so to spread the word and hopefully recruit some more volunteer interviewees. 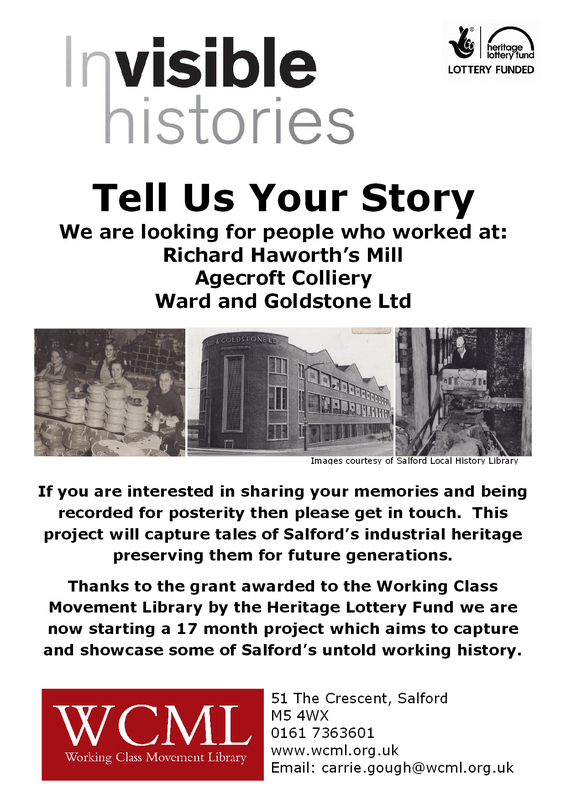 If you worked at Richard Haworth’s, Ward and Goldstone Ltd or the Agecroft Colliery and want to share your memories and add to the Library’s audio archive then drop us a line. I am off to the Museum of Science and Industry’s archives to have a look at their collection relating to Agecroft Colliery which was housed there following the closure of the Lancashire Museum of Mining at Buile Hill. I’m looking forward to having a rummage and seeing what I can find. I am also writing a few paragraphs about our object of the month which will go up on the website and will be highlighting the 160th anniversary of the first free public library! Something Manchester should be very proud of. I am very grateful for the re-tweets and re-blogs that we have been getting and for the general positive response to the project. This entry was posted on September 7, 2012 at 9:51 am	and is filed under News, Uncategorized. Tagged: invisible histories, local history, oral history, Salford's working lives. You can follow any responses to this entry through the RSS 2.0 feed. You can leave a response, or trackback from your own site.